There are a few interesting considerations in this new Twitter test. As reported by various Twitter users, and confirmed by Twitter (to Slate), the company recently ran a small-scale trial of recommendations of who people should stop following in order to improve their Twitter experience. Social media advisor Matt Navarra (via David Pearce) shared this screenshot of the option. Twitter says that the test ran for only a few days, with only a small amount of users, and has now been completed. 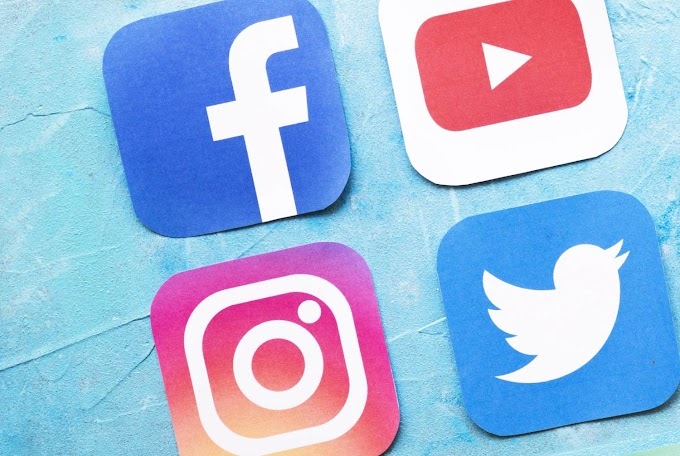 There’s no word on a future, broader rollout of the same, but as noted, it raises some interesting questions about evolving social media usage. Really, the test makes sense. If Twitter can tap into its usage insights to determine people who you don’t usually interact with, then recommend you cut them off, that could very well improve your Twitter experience. Fewer tweets you don’t care about means a more engaging timeline overall – but of course, most users these days are aware of their unfollow options and may see the suggestions as an intrusion, or indeed, potential censorship in the case of political profiles. But Twitter’s wording is interesting – “unfollowing people they don’t engage with regularly”. Twitter obviously wants more people to actively participate in discussion via tweet, which requires back-and-forth interaction - but chances are a lot of the people you follow on Twitter are not profiles you're looking to actively converse with, celebrities and the like who you follow for breaking news and updates. 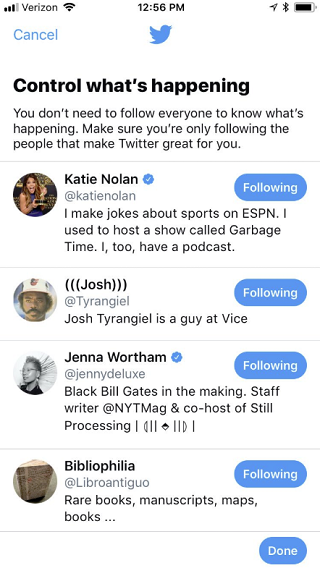 That could be why profiles like ESPN’s Katie Nolan appear in the second screenshot above – that’s not to say that Nolan isn’t active, nor that you don’t like her tweets, but because there’s no record of interaction between you both, she shows up as a potential unfollow. This probably suggests that Twitter doesn’t quite have the methodology right as yet, especially given the news feed type nature of the Twitter feed. 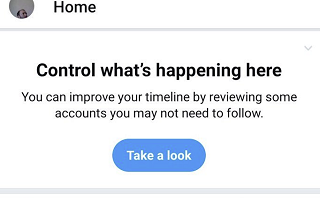 It would probably be safe to say that the majority of accounts you follow on Twitter you’re not actively engaging with on a regular basis, and that could make such recommendations difficult, with the utility of them reliant on highly targeted behavioral insight. But the other element the test highlights is the changing nature of social media usage. 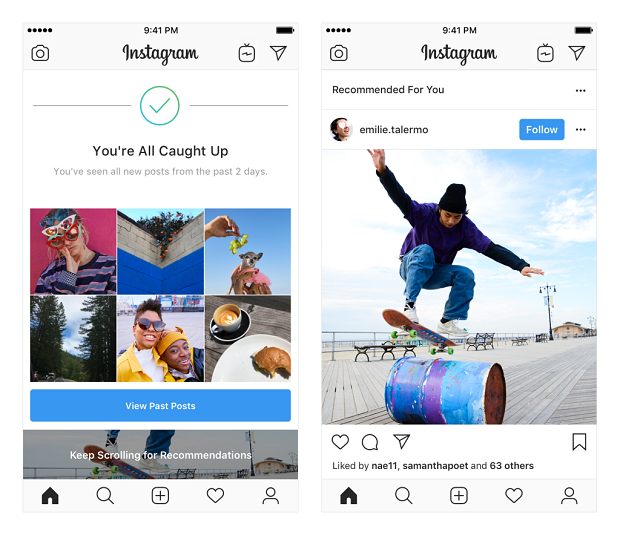 Earlier this month, Instagram launched a new test of a recommended posts in feeds, which show up once you’ve seen everything from the profiles you follow. 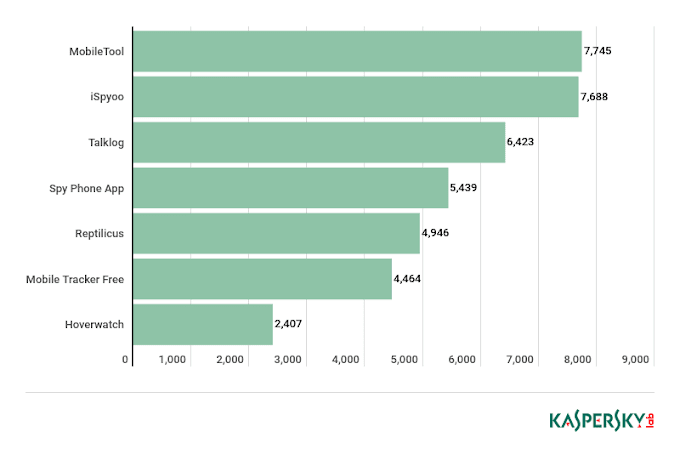 Instagram’s keen to boost discovery, and keep people around on platform for longer – but the interesting thing here is that the tool almost runs counter to the News Feed algorithm approach on Facebook, which was implemented to sort through the thousands of posts from Pages and profiles you follow in order to ensure you only see the most relevant ones. That underlines a shift in usage. In the past, users have seemingly been more willing to follow more Pages and connect with more people, which is what lead to Facebook News Feeds becoming overloaded, hence the need for the algorithm. On Instagram, this new test indicates that a significant number of users are reaching the end of their fresh content stream regularly, leaving an opportunity for more discovery – which suggests that on IG, which rose to prominence after Facebook and Twitter, people are being more selective about who they follow. Instagram's seeing high levels of engagement, and growing fast – could it be that a part of that growth is that users are more choosy, more deliberate about their follows, and that's leading to a better experience? That would suggest that Twitter is on the right track here. While there may be some controversy around Twitter telling users to unfollow certain accounts, it could help them boost engagement, and reduce the followings of people who’ve built their audience on the back of out-dated, “follow back” style tactics, and are actually sharing little of value. Given this, I actually think this is a positive move from Twitter. Sure, there’s potential for user outcry, and as noted, they do need to get their recommendations right. But it could help further reduce questionably inflated follower counts, and improve response rates amongst profiles which are of relevance.